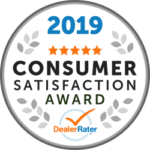 AAA Carolinas Auto Buying Service has been awarded a 2019 DealerRater Consumer Satisfaction Award. This recognition is given to auto dealerships that deliver outstanding customer service as rated by online consumer reviews and is meant to give online car shoppers a way to instantly spot dealers that provide high-quality customer service. With 168 lifetime reviews to date, AAA Carolinas Auto Buying maintains a 5 out of 5 review score on DealerRater with 100% of customers saying they recommend the service. That’s because it makes purchasing new or used vehicles a breeze for members and non-members alike. And while AAA keeps a browsable inventory of vehicles, one of the biggest values comes from the concierge service. Customers can tell their AAA car buying counselor what make and model of car they’d like, what accessories are musts or what would be welcome, and how much they’re willing to pay. The experts at AAA then go out and locate the exact car the customer wants and bring it right to their door. This level of service can reduce costs, remove stress, and eliminate the hassle of buying a new or used car, leaving you with nothing but a new ride and a positive experience. To take advantage of this award-winning program, contact a AAA Auto Buying specialist today and begin your experience with hassle-free car buying. Click below or call 1-855-854-0222.